외부 컴퓨팅 디바이스의 성능을 개선시키기 위한 어댑티브 메모리 시스템이 제공된다. The adaptive memory systems to improve the performance of the external computing device is provided. 어댑티브 메모리 시스템은 단일 컨트롤러, 제 1 메모리 유형(예를 들면 정적 랜덤 액세스 메모리 또는 SRAM), 제 2 메모리 유형(예를 들면, 동적 랜덤 액세스 메모리 또는 DRAM), 제 3 메모리 유형(예를 들면 플래시), 내부 버스 시스템, 및 외부 버스 인터페이스를 포함한다. Adaptive memory systems have a single controller, the first type of memory (e.g. static random access memory or SRAM), a second type of memory (e.g., dynamic random access memory or DRAM), a third type of memory (e.g., flash) and it includes an internal bus system and an external bus interface. 단일 컨트롤러는 (ⅰ)내부 버스 시스템을 이용하여 3 가지 메모리 유형 모두와 통신하고; A single controller in communication with all three types of memory by using the internal bus system (ⅰ); (ⅱ) 외부 버스 인터페이스를 이용하여 외부 컴퓨팅 디바이스와 통신하고; (Ⅱ) communicate with the external computing device through the external bus interface; 및 (ⅲ) 제 1 메모리 유형 내의 스토리지 공간에 캐시-데이터 스토리지 할당을 하고, 제 1 메모리 유형 내의 스토리지 공간이 채워진 것으로 판정된 후에, 캐시-데이터 스토리지 할당을 제 2 메모리 유형 내의 스토리지 공간에 할당; And (ⅲ) a first storage space in the memory type cache and a data storage allocation, the first after a determination to be filled with a storage space in the memory type, a cache-allocates the data storage allocation in the storage space in the second memory type; 하도록 설정된다. It is set to. 본 발명은 메모리 시스템에 관한 것으로, 특히 외부 컴퓨팅 디바이스의 성능을 개선시키기 위한 어댑티브 메모리 시스템에 관한 것이다. The present invention relates to memory systems and in particular relates to adaptive memory systems to improve the performance of the external computing device. 현대 컴퓨팅 디바이스는 일반적으로 상이한 엔드 애플리케이션을 지원하는 데에 필요한 다수의 상이한 유형의 내부 메모리 컴포넌트를 구비한다. And Modern computing devices are generally provided with a different end applications, a number of different types of internal memory components required to support. 이러한 메모리 컴포넌트와 그의 연관된 특성은 컴퓨팅 디바이스의 성능이 측정될 수 있는 중요한 측정수단의 일부이다. These memory components and their associated attribute is a part of the relevant measurement means that can be measured, the performance of the computing device. 현대 컴퓨팅 디바이스는 대개 PCI 버스, 방화벽 포트, USB 포트, 또는 전용 멀티미디어 카드(MMC) 포트와 같은 다양한 빌트인 통신 채널을 통해 애드-온 메모리 컴포넌트로 더 기능할 수 있다. Modern computing devices are usually built through a variety of communication channels, such as the PCI bus, a firewall port, USB port, or a dedicated Multimedia Card (MMC) Port add-on can further function as a memory component. 이러한 내부 및 애드-온 메모리 컴포넌트는 휘발성 또는 비휘발성 메모리, 또는 그의 조합으로 구성된다. These internal and add-on memory component is of a volatile or non-volatile memory, or a combination thereof. 낸드 플래시 및 노어 플래시는 비휘발성 메모리의 일반적인 유형이다. NAND Flash and NOR Flash is the most common type of non-volatile memory. 동적 랜덤 액세스 메모리(DRAM)와 정적 랜덤 액세스 메모리(SRAM)는 휘발성 메모리의 유형이다. Dynamic random access memory (DRAM) and static random access memory (SRAM) is a type of volatile memory. 메모리 유형은 성능 및 밀집도에 기초하여 분류된다. Memory types are classified on the basis of the performance and density. SRAM과 같은 고성능 메모리는 더 크고, 구현하기에 보다 고비용이고, 더 많은 전력을 소비한다. High-performance memories such as SRAM is bigger, more expensive to implement, and consume more power. DRAM과 같은 더 고밀도의 메모리는 보다 비용 효율적이지만, 일반적으로 단일 엘리먼트에 대한 액세스 시간, 대역폭, 또는 메모리 시스템에 포함된 데이터 또는 명령어를 요구하는 처리 엘리먼트로 메모리 컨텐츠를 전송하는 속도에 의해 측정되는 성능은 보다 열화한다. But more dense in the memory such as DRAM is more cost-effective, in general, the access time, bandwidth, or performance as measured by the rate of transmitting the memory content of the data or instructions contained in a memory system to the processing elements required for a single element, It is more degraded. 이러한 연관된 상충관계는 특히 이러한 현대 메모리 시스템이 랩탑 컴퓨터, 휴대전화, PDA, 또는 기타 다양한 초-소형의 개인 컴퓨팅 디바이스과 같은 모바일 디바이스에서 구현될 때 중요해진다. This trade-off is associated with a particular memory system such modern laptop computer, a cell phone, PDA, or a variety of other super-is important when implemented in small-sized mobile devices, such as personal computing dibayiseugwa. 이러한 디바이스에서, 전력 소비와 폼 팩터의 추가적인 고려사항은 메모리 리소스가 최적으로 설정되고 활용되는 것을 중요하게한다. In this device, additional considerations of power consumption and the form factor is important that the memory resources has been set up and utilized optimally. 다행히, 컴퓨터 제품 집적화의 수준이 향상됨에 따라 메모리 데이터-전송 및 연관된 처리 속도를 현저하게 개선하는 특징을 가지면서 다수의 메모리 유형이 단일한 완전한 메모리 시스템 패키지로 패키징할 수 있도록 한다. Fortunately, memory data based on improved levels of computer products integrated - so he kind of transport and features that significantly improve the processing speed can be associated with a complete packaging system memory package, a plurality of memory types single. 이러한 집적 패키징이 유용한 하나의 특정한 애플리케이션은 캐시 메모리 시스템이다. This integrated package is a useful one particular application is a cache memory system. 대부분의 현대 컴퓨팅 시스템은 레벨 1 및 레벨 2의 SRAM 캐시를 모두 구비한 집적된 캐싱 시스템을 가진다. Most modern computing systems have an integrated cache system with all of the SRAM cache of level 1 and level 2. 일반적으로, 프로세서는 메모리로부터 유사한 데이터에 액세스하는 평균 시간을 감소시키기 위해 캐시를 이용한다. Generally, a processor uses the cache to reduce the average time to access the similar data from the memory. SRAM 캐시는 소용량, 고속 메모리 유형이고, 이는 주메모리 위치로부터 빈번하게 액세스 되는 데이터의 사본을 저장한다. SRAM cache is a small-capacity, high-speed type memory, which stores a copy of data that is frequently accessed from the main memory location. 프로세서가 주 메모리 위치로부터 판독하거나 또는 그로 기록하려고 시도할 때, 그것은 먼저 이전에 저장된 유사한 데이터의 사본이 가용한지 여부를 확인하기 위해 캐시 메모리 위치를 검사한다. When the processor attempts to read or write him or from the main memory location, it first checks the cache memory location to determine whether the available copies of similar data previously stored. 프로세서는 캐시 히트가 있는지(데이터가 캐시에 존재하는지)를 확인하기 위해 데이터 어드레스 메모리 위치를 캐시와 비교함 으로써 이를 수행한다. The processor does this by comparing the address data with the cache memory locations to determine whether there is a cache hit (that file is present in the cache). 프로세서가 캐시에서 데이터를 발견하지 못하면, 캐시 미스가 발생하고 프로세서는 하드 디스크 또는 플래시 메모리와 같은 보다 느린 주 메모리 위치에서 데이터를 액세스할 필요가 있기 때문에 훨씬 더 느린 데이터 검색 속도로 동작해야만 한다. If the processor is not found in the data cache, a cache miss occurs, the processor must operate at a much slower data retrieval because you need to access data from the slower main memory location than as a hard disk or flash memory. 빈번하게 액세스되는 데이터를 발견하기 위해 가장 느린 메모리 유형에 액세스할 필요성을 감소시키는 것과 같이 어떤 식으로든 캐시 히트를 증가시키는 것이 이롭다. Any way such as to reduce the need to access the slower memory types in order to find the data that is frequently accessed serve advantageously to increase the cache hit. 추가로, 대부분의 현대의 애드-온 메모리 시스템은 플래시 제어가 외부 컴퓨팅 디바이스의 프로세서에서의 오프 서킷에서 발생하는 플래시 메모리 및 RAM 메모리를 포함한다. Additionally, most contemporary add-on memory system includes a flash memory and a RAM memory, a flash occurs in the off-control circuit in an external computing device processor. 이러한 유형의 시스템은 플래시와 RAM 메모리 사이의 전송이 외부 프로세서 버스를 지나 애드-온 메모리 시스템의 플래시로부터 외부컴퓨팅 디바이스 프로세서로, 그리고 다시 외부 프로세서 버스를 지나 애드-온 메모리 시스템의 RAM으로 데이터를 라우팅함으로써 가능하게 되어야 하기 때문에 비효율적이다. Past the external computing device processor from the flash of the whole memory system, and back to the external processor bus add-this type of system, the transmission between the flash and RAM memory through the external processor bus add routes the data to the whole memory system RAM inefficient because it must be made possible by. 본 요약은 하기의 상세한 설명에서 더 기술되는 간략화된 형태의 개념 중 선택된 것을 소개하기 위해 제공된다. This summary is provided to introduce the concept of a selected one of a simplified form that are further described in the detailed description below. 상기 요약은 청구된 주제의 중요한 특징을 식별할 것을 의도하지 않고, 또한 청구된 주제의 범위를 결정하는 데에 보조로서 사용될 것을 의도하지도 않는다. The summary is not even intended to be used as an auxiliary in determining the scope of the not intended to identify key features of the claimed subject matter, and the claimed subject matter. 상기 배경 설명에서 논의된 것과 같은 종래 기술의 메모리 시스템에 연관된 비효율성에 대해, 본 발명의 발명자는 저가의 DRAM 기술을 이용하면서 동시에 동일한 애드-온 메모리 시스템의 메모리 컴포넌트 사이의 직접 메모리 전송을 허용하는 캐시 확장을 가능하게 하는 어댑티브 메모리 디바이스를 발명하였다. For inefficiencies associated with the memory system of the prior art as discussed in the background description, the inventors of the present invention while using a low-cost DRAM technology at the same time the same add-in that allows the direct memory transfer between the one of the memory system memory component an adaptive memory device that enables a cache extension invented. 또한, 본 발명은 이롭게도 전용 캐싱 알고리즘을 이러한 확장된 캐시 및 내부 메모리 액세스를 활용하기 위해 통합할 수 있다. The invention may also be combined to take advantage of these extended cache and the internal memory access the caching algorithms only benefit. 본 발명의 하나의 실시예에 따르면, 외부 컴퓨팅 디바이스의 성능을 개선시키기 위한 어댑티브 메모리 시스템이 제공된다. According to one embodiment of the present invention, the adaptive memory systems to improve the performance of the external computing device it is provided. 어댑티브 메모리 시스템은 단일 컨트롤러, 제 1 메모리 유형(예를 들면 정적 랜덤 액세스 메모리 또는 SRAM), 제 2 메모리 유형(예를 들면, 동적 랜덤 액세스 메모리 또는 DRAM), 제 3 메모리 유형(예를 들면 플래시), 내부 버스 시스템, 및 외부 버스 인터페이스를 포함한다. Adaptive memory systems have a single controller, the first type of memory (e.g. static random access memory or SRAM), a second type of memory (e.g., dynamic random access memory or DRAM), a third type of memory (e.g., flash) and it includes an internal bus system and an external bus interface. 단일 컨트롤러는 (ⅰ) 내부 버스 시스템을 이용하여 3 가지 메모리 유형 모두와 통신하고; A single controller in communication with all three types of memory by using the internal bus system (ⅰ); (ⅱ) 외부 버스 인터페이스를 이용하여 외부 컴퓨팅 디바이스와 통신하고; (Ⅱ) communicate with the external computing device through the external bus interface; 및 (ⅲ) 제 1 메모리 유형 내의 스토리지 공간에 캐시-데이터 스토리지 할당을 하고, 제 1 메모리 유형 내의 스토리지 공간이 풀(full)이 된 것으로 판정된 후에, 캐시-데이터 스토리지 할당을 제 2 메모리 유형 내의 스토리지 공간에 할당; And (ⅲ) the first cache to the storage space in the memory type - in the data storage allocation second memory type - a data storage allocation, after the first storage space in the memory type is judged to be full (full), the cache assigned to the storage space; 하도록 설정된다. It is set to. 본 발명의 하나의 측면에 따르면, 제 1 및 제 2 메모리 유형은 별개의 휘발성 메모리 유형(예를 들면 SRAM 및 DRAM)이고, 제 3 유형의 메모리 유형은 비휘발성 유형(예를 들면, 플래시)이고, 단일 컨트롤러는 전력 소비를 최소화하기 위해 기록되지 않은 제 1 및 제 2 메모리 유형의 일부의 전원을 차단하도록(power down) 더 설정된다. According to one aspect of the invention, the first and second type of memory is separate from the volatile memory type (for example, SRAM, DRAM), the memory type of the third type is a non-volatile type (e. G., Flash) and , a single controller is further set (power down) to the first and second block some of the power of the memory type that was not recorded in order to minimize power consumption. 본 발명의 하나의 측면에 따르면, 단일 컨트롤러는 SRAM 또는 플래시 메모리 중 어느 하나로부터 DRAM으로 캐시-데이터 전송을 하도록 더 설정된다. According to one aspect of the invention, a single controller is a DRAM cache from either SRAM or flash memory, is further configured to transmit the data. 캐시-데이터가 SRAM 내에 존재한다면, 캐시-데이터는 SRAM으로부터 DRAM으로 전송된다. If data exists in the SRAM, the cache-cache data is transferred from the DRAM to SRAM. 캐시-데이터가 SRAM 내에 존재하지 않고, 플래시 메모리 내에 존재한다면, 캐시-데이터는 플래시 메모리로부터 DRAM으로 전송된다. Cache - Data is not present in the SRAM, when present in the flash memory, cache data is transferred from the DRAM to the flash memory. 본 발명의 또다른 측면에 따르면, 단일 컨트롤러는 데이터 미리보기(look-ahead) 스킴에 따라 플래시 메모리로부터 SRAM 또는 DRAM으로 데이터를 캐싱하도록 더 설정된다. In accordance with another aspect of the invention, a single controller is further configured to cache the data to the SRAM or DRAM from the flash memory in accordance with the preview data (look-ahead) scheme. 본 발명의 또다른 실시예에 따르면, 단일 컨트롤러, 제 1 메모리 유형, 제 2 메모리 유형, 제 3 메모리 유형, 내부 버스 시스템, 및 외부 버스 인터페이스를 포함하는 어댑티브 메모리 시스템을 제어하는 방법이 제공된다. According to a further embodiment of the present invention, a method for controlling a single controller, a first memory type and the second type of memory, and the third type of memory, an internal bus system and an adaptive memory system including an external bus interface it is provided. 상기 방법은, 일반적으로: (ⅰ)내부 버스 시스템을 이용하여 3 가지 메모리 유형 모두와 통신하는 단계; The method, generally: by using an internal bus system (ⅰ) communicating with all three types of memory; (ⅱ) 외부 버스 인터페이스를 이용하여 외부 컴퓨팅 디바이스와 통신하는 단계; (Ⅱ) communicating with an external computing device using the external bus interface; 및 (ⅲ) 제 1 메모리 유형 내의 스토리지 공간에 캐시-데이터 스토리지 할당을 하고, 제 1 메모리 유형 내의 스토리지 공간이 풀(full)이 된 것으로 판정된 후에, 캐시-데이터 스토리지 할당을 제 2 메모리 유형 내의 스토리지 공간에 할당하는 단계;를 포함한다. And (ⅲ) the first cache to the storage space in the memory type - in the data storage allocation second memory type - a data storage allocation, after the first storage space in the memory type is judged to be full (full), the cache It includes; assigning a storage space. 본 발명의 또다른 실시예에 따르면, 어댑티브 메모리 시스템의 단일 컨트롤러의 동작을 제어하는 컴퓨터 실행가능한 프로그램을 포함하는 컴퓨터 판독가능한 매체가 제공된다. According to a further embodiment of the present invention, a computer-readable medium comprising computer-executable program for controlling the operation of the single controller in the adaptive memory system is provided. 상기 어댑티브 메모리 시스템은 제 1 메모리 유형, 제 2 메모리 유형, 제 3 메모리 유형, 내부 버스 시스템, 및 외부 버스 인터페이스를 포함한다. The adaptive memory system includes a first memory type and the second type of memory, and the third type of memory, an internal bus system and an external bus interface. 상기 컴퓨터 실행가능 프로그램은 실행시 일반적으로: (ⅰ)내부 버스 시스템을 이용하여 3 가지 메모리 유형 모두와 통신하는 단계; The computer executable program when executed is generally: using (ⅰ) internal bus system communicating with all three types of memory; (ⅱ) 외부 버스 인터페이스를 이용하여 외부 컴퓨팅 디바이스와 통신하는 단계; (Ⅱ) communicating with an external computing device using the external bus interface; 및 (ⅲ) 제 1 메모리 유형 내의 스토리지 공간에 캐시-데이터 스토리지 할당을 하고, 제 1 메모리 유형 내의 스토리지 공간이 풀(full)이 된 것으로 판정된 후에, 캐시-데이터 스토리지 할당을 제 2 메모리 유형 내의 스토리지 공간에 할당하는 단계;의 3 단계를 포함하는 방법을 상기 단일 컨트롤러가 수행하도록 한다. And (ⅲ) the first cache to the storage space in the memory type - in the data storage allocation second memory type - a data storage allocation, after the first storage space in the memory type is judged to be full (full), the cache assigning a storage space; the process comprising the three steps of and to perform the single controller. 본 발명의 또다른 실시예에 따르면, 어댑티브 메모리 시스템의 단일 컨트롤러의 데이터 미리보기 캐싱 스킴을 구현하기 위한 컴퓨터 실행가능한 프로그램을 포함하는 컴퓨터 판독가능한 매체가 제공된다. According to a further embodiment of the present invention, an adaptive data preview of the single controller in the memory system of the computer-readable medium comprising computer-executable program for implementing a caching scheme it is provided. 상기 어댑티브 메모리 시스템은 제 1 메모리 유형, 제 2 메모리 유형, 제 3 메모리 유형, 내부 버스 시스템, 및 외부 버스 인터페이스를 더 포함한다. The adaptive memory system further includes a first memory type and the second type of memory, and the third type of memory, an internal bus system and an external bus interface. 상기 컴퓨터 실행가능 프로그램은, 실행시, 일반적으로: (ⅰ) 외부 컴퓨팅 디바이스 상에서의 애플리케이션 실행으로부터 섹터 데이터의 시퀀스를 획득하는 단계; The computer-executable program, when executed, generally comprising the steps of: obtaining a sequence of sectors from the data (ⅰ) application running on the external computing device; (ⅱ) 상기 획득된 섹터 데이터의 시퀀스와 복수의 미리 저장된 섹터 데이터의 시퀀스를 비교하여 네 1 레벨의 매칭이 있는 지를 판정하는 단계; (Ⅱ) determining whether there is matching of the four first level by comparing the sequence of the sectors of the data sequence with the stored plurality of previously acquired data sector; 및 (ⅲ) 상기 획득된 섹터 데이터의 시퀀스와 복수의 미리 저장된 섹터 데이터의 시퀀스 사이에 제 1 레벨의 매칭이 있는 것으로 판정되면, 상기 판정된 제 1 레벨의 매칭 데이터로 적어도 제 1 메모리 유형을 캐싱하는 단계; And (ⅲ) If it is determined between the sequence of the sectors of the data sequence with the stored plurality of previously acquired sectors of data that matches a first level, caching at least a first type of memory to match the data of the determined first level the method comprising; 및 (ⅳ) 획득된 섹터 데이터의 시퀀스와 복수의 미리 저장된 섹터의 시퀀스 사이에 제 1 레벨의 매칭이 있는 것으로 판정되지 않으면, 제 2 레벨의 매칭을 가지는 복수의 미리 저장된 섹터 데이터의 시퀀스로부터 섹터 데이터의 시퀀스가 선택될 수 있는지를 판정하는 단계;의 4 개의 단계를 포함하고, 상기 제 1 레벨의 매칭은 상기 제 2 레벨의 매칭보다 매칭의 가능성이 더 높은 방법을 상기 단일 컨트롤러로 하여금 수행하도록 한다. And (ⅳ) obtaining a sector if the data between the sequence and the sequence of the plurality of previously stored sectors are determined to be a match of the first level, the sector data from the sequence of the second level of a plurality of pre-stored in the sector data having the matching of of determining whether the sequence is to be selected; includes four steps, the matching of the first level is to carry out causing the possibility of matching higher way than the matching of the second level to the single controller, . 본 발명의 하나의 측면에 따라, 상기 제 2 레벨의 매칭을 가지는 섹터 데이터의 시퀀스가 선택될 수 있다면, 상기 선택된 제 2 레벨의 매칭을 가지는 섹터 데이터의 시퀀스가 제 1 메모리 유형 또는 제 2 메모리 유형으로 캐싱되고; According to one aspect of the invention, if the sequence of the sector data having the matching of the second level may be selected, with the matching of the selected second level the sequence of the sector data, the first memory type or the second memory type and caching; 상기 제 2 레벨의 매칭을 가지는 섹터 데이터의 시퀀스가 선택될 수 없다면, 캐시-데이터 트레이닝 시퀀스가 시작된다. If the sequence of the sector data having the matching of the second level may be selected, the cache-data training sequence is started. 본 발명의 또다른 측면에 따르면, 캐시 데이터 트레이닝 시퀀스는 제 3 메모리 유형에 저장된 시퀀스의 비휘발성 사본을 가지면서 제 1 메모리 유형 또는 제 2 메모리 유형 중 어느 하나 내에 획득된 섹터 데이터의 시퀀스를 저장한다. In accordance with another aspect of the invention, the cache data, training sequence and stores the sequence of the sector data obtained in the third one of the first memory type or the second memory type while having a non-volatile copy of the sequence stored in the memory type . 본 발명의 추가적인 실시예에 따르면, 어댑티브 메모리 시스템의 단일 컨트롤러의 데이터 미리보기 캐싱 스킴을 구현하는 방법이 제공된다. According to a further embodiment of the invention, there is provided a data preview of a single controller to implement the caching scheme of the adaptive memory systems. 어댑티브 메모리 시스템은 단일 컨트롤러, 제 1 메모리 유형, 제 2 메모리 유형, 제 3 메모리 유형, 내부 버스 시스템, 및 외부 버스 인터페이스를 포함한다. The adaptive memory system includes a single controller, a first memory type and the second type of memory, and the third type of memory, an internal bus system and an external bus interface. 상기 방법은, 일반적으로: (ⅰ) 외부 컴퓨팅 디바이스 상에서의 애플리케이션 실행으로부터 섹터 데이터의 시퀀스를 획득하는 단계; The method includes generally the steps of: obtaining a sequence of sectors from the data (ⅰ) application running on the external computing device; (ⅱ) 복수의 미리 저장된 섹터 데이터의 시퀀스와 상기 획득된 섹터 데이터의 시퀀스를 비교하여 제 1 레벨의 매칭이 있는 지를 판정하는 단계; (Ⅱ) determining whether there is matching between the first level and the comparing the sequence of the obtained sector data, and a sequence of a plurality of pre-stored in the sector data; 및 (ⅲ) 상기 획득된 섹터 데이터의 시퀀스와 복수의 미리 저장된 섹터 데이터의 시퀀스 사이에 제 1 레벨의 매칭이 있는 것으로 판정되면, 상기 판정된 제 1 레벨의 매칭 데이터를 적어도 제 1 메모리 유형에 캐싱하는 단계; And (ⅲ) If it is determined between the sequence of the sectors of the data sequence with the stored plurality of previously acquired sectors of data that matches a first level, cache the matching data of the determined first level in at least a first type of memory the method comprising; (ⅳ) 상기 획득된 섹터 데이터의 시퀀스와 복수의 미리 저장된 섹터 데이터의 시퀀스 사이에 제 1 레벨의 매칭이 있는 것으로 판정되지 않으면, 제 2 레벨의 매칭을 가지는 복수의 미리 저장된 섹터 데이터의 시퀀스로부터 섹터 데이터의 시퀀스가 선택될 수 있는지를 판정하는 단계;의 4 개의 단계를 포함하고, 상기 제 1 레벨의 매칭은 상기 제 2 레벨의 매칭보다 매칭의 가능성이 더 높은 것이다. (Ⅳ) sector from the sequence of the If a sequence with a plurality of sectors of data stored in advance obtained between the sequence of the sector data is not determined that the matching of the first level, stored in the plurality having the matching of the second level pre-sector data determining whether the sequence of data may be selected; includes four steps in and matching of the first level is a higher probability of matching than the matching of the second level. 본 발명의 하기의 측면과 수반되는 다수의 이점은 첨부도면을 함께 참조할 때 하기의 상세한 설명을 참조하여 더 잘 이해되는 것처럼 보다 용이하게 이해될 것이다. Number of advantages associated with the side surface of to the present invention will be readily understood, as is better understood by reference to the following detailed description with reference to the accompanying drawings. 도 1은 본 발명의 하나의 실시예에 따른 어댑티브 메모리 시스템(AMS)의 블록도이다. Figure 1 is a block diagram of an adaptive memory system (AMS) in accordance with one embodiment of the present invention. 도 2는 종래기술에 따른 외부 컴퓨팅 디바이스와의 종래 메모리 시스템 인터페이스를 도시하는 블록도이다. 2 is a block diagram showing a conventional memory system interface to the external computing device in accordance with the prior art. 도 3은 본 발명의 하나의 실시예에 따른 AMS 파일 시스템 파티션을 예시하는 블록도이다. 3 is a block diagram illustrating the AMS file system partition, in accordance with one embodiment of the present invention. 도 4는 본 발명의 하나의 실시예에 따른 AMS 컨트롤러에 의해 활용되는 AMS 메모리 컴포넌트와 프로세서 사이의 상세한 데이터 흐름을 예시하는 블록도이다. 4 is a block diagram illustrating a detailed flow of data between the processor and memory components AMS AMS utilized by the controller according to one embodiment of the invention. 도 5는 본 발명의 하나의 실시예에 따른 상이한 동작 처리 스테이지에서의 데이터 흐름 전송을 예시하는 AMS 컨트롤러에 대한 상태 기계 다이어그램 (State Machine Diagram)이다. Figure 5 is a state machine diagram (Diagram State Machine) on the AMS controller illustrating the flow of data transmission in a different operating stage process according to one embodiment of the invention. 도 6은 본 발명의 하나의 실시예에 따른 AMS SRAM 및 DRAM 캐시의 부분을 채우는 AMS 컨트롤러 캐시 데이터 미리보기 스킴을 예시하는 흐름도이다. Figure 6 is a flow diagram illustrating one embodiment of the present pre-AMS controller cache data to fill a part of the SRAM and DRAM cache AMS scheme in accordance with the view of the invention. 도 7은 본 발명의 하나의 실시예에 따른 AMS 컨트롤러 캐시 데이터 미리보기 스킴과 연관된 트레이닝 시퀀스를 예시하는 흐름도이다. 7 is a flow diagram illustrating a training sequence associated with the data cache controller AMS preview scheme according to one embodiment of the invention. 도 8은 본 발명의 하나의 실시예에 따른 AMS 컨트롤러 캐시 데이터 미리보기 스킴과 연관된 트레이닝 시퀀스를 예시하는 흐름도이다. Figure 8 is a flow chart illustrating a training sequence associated with the data cache controller AMS preview scheme according to one embodiment of the invention. 도 9는 본 발명의 하나의 실시예에 따른 AMS 컨트롤러의 데이터 흐름과 연관된 대역폭 할당을 예시하는 블록도이다. 9 is a block diagram illustrating a bandwidth allocation associated with the data stream of AMS controller according to one embodiment of the invention. 본 발명은, 휘발성 및 비휘발성 메모리 컴포넌트, 메모리 컴포넌트 사이와 메모리 컴포넌트와 외부 컴퓨팅 디바이스 사이의 데이터 전송을 관리하도록 구성된 컨트롤러 컴포넌트를 구비한 어댑티브 메모리 시스템(AMS)에 관한 것이다. The present invention relates to a volatile and non-volatile memory component, the memory component and between the memory component and an adaptive memory system (AMS) a controller component that is configured to manage the data transfer between the external computing device. 본문에서 집합적으로 AMS 컴포넌트라고 하는, 메모리 컴포넌트와 컨트롤러 컴포넌트는 다중칩 패키지 집적회로(MCP)에 내장되고, 이는 데스크탑 PC, 랩탑 PC, 휴대전화, PDA, 또는 휴대용 PC(UMPC)와 같은 임의의 일반적인 개인용 컴퓨팅 디바이스로 착탈가능하게 삽입되도록 설정가능하게 설계될 수 있다. In the text collectively called the AMS components, memory components and a controller components, is contained in a multi-chip package integrated circuit (MCP), which desktop PC, a laptop PC, a mobile phone, PDA, or any such mobile PC (UMPC) set to be removably inserted into a general personal computing device may be designable. 본 발명은 또한 AMS와 외부 컴퓨팅 디바이스 사이의 데이터 전송에 연관된 전체 성능을 확장시키는 AMS 컨트롤러 컴포넌트에 의해 구현되는 데이터 전송 제어 스킴에 관한 것이다. The invention also relates to a data transfer control scheme implemented by the AMS controller component that extends the overall performance associated with the data transfer between the AMS and the external computing device. 도 1에 도시된 하나의 실시예에 따르면, AMS(10)는 정적 랜덤 액세스 메모리(SRAM)(14), 동적 랜덤 액세스 메모리(DRAM)(16), 및 플래시 메모리(18)를 포함하는 다수의 AMS 메모리 컴포넌트 유형을 포함한다. According to one embodiment illustrated in Figure 1, AMS (10) includes a plurality of containing a static random access memory (SRAM), (14), dynamic random access memory (DRAM) (16), and a flash memory 18 AMS includes a memory component types. 본 실시예의 메모리 컴포넌트 유형은 AMS 내에서 기능할 수 있는 메모리 유형의 단순한 예시일 뿐이며, 본 발명 은 본 실시예에서 사용된 정확히 지정된 메모리 유형에 한정되는 것은 아니라는 것을 이해해야한다. The memory component types, this embodiment is only a simple example of a type of memory that can function in the AMS, it is to be understood that the invention is not limited to an exactly specified type of memory used in this embodiment. AMS 컨트롤러 컴포넌트(또는 줄여서 "컨트롤러")(12)는 내부 버스 시스템(20)을 통해 SRAM, DRAM, 플래시 메모리 컴포넌트와 통신하고, 외부 버스 인터페이스(22)를 통해 외부 컴퓨팅 디바이스(도시되지 않음)와 통신하도록 구성된다. AMS controller component (or simply "controller") 12 may communicate with the SRAM, DRAM, Flash memory component, and via an external bus interface 22, an external computing device (not shown) through an internal bus system 20 and a It is adapted to communicate. 이러한 구성은 AMS 컨트롤러(12)가 외부 컴퓨팅 디바이스에 독립적으로, 메모리 컴포넌트 사이에서의 데이터 흐름을 완벽하게 관리하도록 한다. This arrangement AMS controller 12 is to fully manage the flow of data between independent of the external computing device, the memory components. 유사한 메모리 컴포넌트 유형을 구비하는 일반적인 MCP 메모리 디바이스에서, 도 2에 예시된 바와 같이, 플래시 메모리 데이터 전송에 대한 제어는 외부 컴퓨팅 디바이스에서 발생한다. In a typical MCP memory device having a similar type of memory component, as illustrated in Figure 2, control of the flash memory, the data transfer occurs at the external computing device. 예를 들면, 애플리케이션이 외부 컴퓨팅 디바이스에서 실행되고, 애플리케이션 데이터가 MCP 메모리 디바이스(30)의 플래시 메모리 컴포넌트(36)와 RAM 메모리 컴포넌트(32, 34) 사이에 전송되는 것이 요구될 때(예를 들면, 애플리케이션 페이지 데이터를 캐싱할 때), 외부 컴퓨팅 디바이스(40)의 프로세서는 집적된 플래시 컨트롤러(42)를 이용하여 플래시 데이터의 전송을 제어한다. For example, an application running on the external computing device, the application data when required to be transmitted between the MCP memory device 30. Flash memory component 36 and the RAM memory components (32, 34) of (e. G. , when caching the application page data), the processor of the external computing device 40 using the integrated flash controller 42 controls the transmission of the data flash. 이러한 시스템에서, 전송가능한 플래시 데이터는 외부 컴퓨팅 디바이스의 프로세서(40)에 의해 MCP 메모리 디바이스의 플래시 메모리 컴포넌트(36)로부터 플래시 인터페이스(39)와 외부 플래시 버스(46)를 지나고, 다시 RAM DDR(Double-data rate) 버스(48)와 RAM 인터페이스(38)를 지나 MCP 메모리 디바이스의 RAM 메모리 컴포넌트(32, 34)로 라우팅되어야 한다. In this system, the transportable flash data is passed to the flash interface 39 and the external flash bus 46 from the flash memory component 36 of the MCP memory device by a processor 40 of the external computing device, again RAM DDR (Double -data rate) should be routed to the bus 48 and the RAM memory components (32, 34) of the memory device through the MCP RAM interface 38. 이러한 데이터 라우팅 스킴은 동일한 MCP 메모리 디바이스 상의 비휘발성(예를 들면 플래시) 및 휘발성(예를 들면 RAM) 메모리 컴포넌트 사이의 데이터 전송(캐싱)에는 비효율적이다. The data routing scheme is inefficient data transfer (cache) between the non-volatile memory device on the same MCP (such as Flash) and volatile (such as RAM) memory component. 예를 들면 도 1에 도시된 것과 같은, 본 발명의 다양한 실시예에 따른 AMS MCP 기술은 AMS 플래시(18)와 RAM(14, 16) 메모리 컴포넌트 사이의 직접 메모리 접근(DMA)을 활용하여, 외부 컴퓨팅 디바이스의 프로세서를 사용할 필요없이 이러한 비효율성을 치유한다. For the same example shown in Figure 1, AMS MCP technology in accordance with various embodiments of the present invention by utilizing a direct memory access between AMS flash 18 and the RAM (14, 16) memory component (DMA), the outer without the need for a processor of a computing device to heal this inefficiency. 본 발명의 온서킷 AMS 컨트롤러(12)는 플래시 메모리 컴포넌트(18)와 RAM 메모리 컴포넌트(14, 16) 사이의 데이터 전송을 제어하여 플래시 데이터가 직접 내부 버스 시스템(20)을 통해 원하는 RAM 메모리 컴포넌트 위치(14, 16)로 전송될 수 있도록 한다. On Circuit AMS controller 12 of the present invention is a flash memory component 18 and the RAM memory components (14, 16), RAM memory component to the desired location by controlling the data transfer between the via flash data directly to the internal bus system 20 so that it can be sent to 14,16. 이러한 DMA 데이터 전송 제어 스킴은 외부 컴퓨팅 디바이스 프로세서를 사용할 필요가 없기 때문에, 효과적으로 AMS와 외부 컴퓨팅 디바이스 사이의 버스인 외부 버스의 외부 버스 대역폭 사용을 감소시킨다. The DMA data transfer control scheme reduces the external bus bandwidth of the bus between Since there is no need for an external computing device, the processor, and an external computing device effectively AMS external bus. 이러한 방식으로, 본 발명의 다양한 실시예에 따라, 외부 버스 대역폭은 외부 컴퓨팅 디바이스의 프로세서가 보다 높은 속도로 AMS 메모리 컴포넌트로부터 데이터를 판독하고 그로 데이터를 기록하도록 최적화될 수 있다. In this way, in accordance with various embodiments of the invention, the external bus bandwidth can be optimized for reading data from memory AMS component in a higher processor speed of the external computing device, and thereby record the data. 또한, AMS 플래시 메모리 컴포넌트(18)와 AMS RAM 메모리 컴포넌트(14, 16) 사이의 더 짧은 물리적 DMA 연결은 상술한 바와 같은 전통적인 전송 스킴에 비해 더 낮은 기생 용량(parasitic capacitance)을 제공한다. In addition, AMS shorter physical DMA connection between the flash memory component 18 and the AMS RAM memory components (14, 16) provides a lower parasitic capacitance (parasitic capacitance) than the conventional transmission scheme as described above. 회로에서의 과잉 기생 용량은 대역폭을 감소시키고, 외부 간섭의 가능성을 높이고, 정상 회로 동작 상태 동안의 전력 소비를 증가시키는 것으로 알려져있다. Excessive parasitic capacitance in the circuit is known to reduce the bandwidth and, increases the possibility of external interference, increase the power consumption of the circuit during the normal operation state. 본 발명에서 달성된 더 짧은 배선 길이의 데이터 전송은 데이터가 이러한 AMS 메모리 컴포넌트 사이에 반복되어 전송될 때(예를 들면, 페이지 데이터 캐싱시에) 현저한 전력 절감을 제공한다. The present invention further data transfer of a short wiring length is achieved at the time data is repeated between these AMS memory component to be transmitted (for example, when page data cache) provides significant power savings. AMS 메모리 컴포넌트 데이터 전송 제어를 외부 컴퓨팅 디바이스의 프로세서 와 분리시키는 또다른 이점은 이송 이전에 AMS 내에 실제 파일 관리 시스템 기능이 내장된다는 것이다. Another advantage of the AMS memory component separate from the data transfer control processors of the external computing device is that the real file management system built within the AMS before the transfer. 이것은 AMS가 표준 파일 시스템으로서 외부 컴퓨팅 디바이스에게 보여지도록 한다. This AMS is to be presented to an external computing device as a standard file system. 표준 파일 시스템은 표준 운영 시스템 레벨 드라이버에 의해 지원될 수 있어서, 운영 체제 레벨에서 전용 플래시-종속 디바이스 드라이버를 유지할 필요성이 제거된다. This will remove the need to maintain the slave device driver - a standard file system to be able to be supported by the standard operating system-level software driver, the flash from the operating system level. AMS의 자급자족 플래시 드라이버 소프트웨어는 도 3에 도시된 AMS 파일 시스템 파티션(50)의 내장 SRM/DRAM/플래시 설치가능 파일 시스템 파티션(54) 내에 포함된다. AMS self-sufficiency of the flash driver software is included in the built-in SRM / DRAM / Flash installable file system partition 54 of the AMS system partition file 50 shown in FIG. 도시된 실시예에서, 다른 AMS 파일 시스템 파티션은 표준 FAT 파일 시스템 파티션(52), 및 부트 파티션과 플래시 인터페이스 데이터를 구비한 디바이스 설정 파티션(56)을 포함한다. In the illustrated embodiment, the other AMS file system partition comprises a device setting partition (56) equipped with a standard FAT file system partition 52, and a boot partition and a flash interface data. 내장 플래시 드라이버 소프트웨어는 운영 시스템과 통합하는 시점에서 추가적인 테스트를 필요로하지 않는다. The built-in flash driver software and does not require additional testing at the point of integration with the operating system. 이러한 독립적인 메모리 드라이버 제어는 이롭게도 AMS에 대해 외부 컴퓨팅 디바이스 상에 전용 메모리 드라이버 소프트웨어를 추가로 설치할 필요없이 대부분의 운영 시스템에 의해 인식되도록 한다. These independent memory driver control is such that advantageously no need for the AMS to install additional memory dedicated driver software on the external computing device recognized by most operating systems. AMS 컨트롤러(12)는 AMS SRAM과 DRAM 휘발성 메모리 컴포넌트(14, 16)의 부분으로 전력 흐름을 선택적으로 게이팅함으로써 전력 소비를 최소화하도록 더 설정된다. AMS controller 12 is further configured to minimize power consumption by selectively gating the power flow as a part of the AMS SRAM and DRAM volatile memory components (14, 16). 이러한 전력 절감 기술은 종래 기술에 공지된 바와 같이 SRAM과 DRAM 휘발성 메모리 유형 모두가 그들 각각의 메모리 영역의 부분내에 유지되는 기존 데이터를 관리 또는 리플레시하기 위해 일정한 소비전력을 필요로 하기 때문에 바람직하다. This power-saving technique is preferable because it requires a constant power consumption in order to during administration or refresh the existing data SRAM and DRAM volatile memory type, all as is known in the prior art is maintained in the portion of their respective memory area. 본 발명의 다양한 예시적인 실시예에서, 이러한 AMS에서의 소비전력을 최소화하기 위해, 컨트롤러(12)는 SRM 또는 DRAM(14, 16)의 부분이 기록하도록 스케줄링되지 않고 아직 데이터를 가지고 있지 못한 때를 검지하기 위해 RAM 메모리 컴포넌트를 모니터링한다. In various exemplary embodiments of the present invention, in order to minimize the power consumption in these AMS, controller 12 when failure is not have the still data is not scheduled to record part of the SRM or DRAM (14, 16) to detect and monitor the RAM memory component. RAM의 비활성화된 부분 검지시, 컨트롤러(12)는 전력 손실을 최소화하기 위해 SRAM 또는 DRAM(14, 16)의 비활성화된 부분의 전원을 차단한다. When detecting the disabled portion of the RAM, the controller 12 cuts off power to the disabled portion of the SRAM or DRAM (14, 16) to minimize power loss. 이러한 방식으로, 전력 소비는 외부 컴퓨팅 디바이스의 프로세서의 입력을 필요로하지 않으면서 AMS 디바이스 내에서부터 동적으로 조정될 수 있다. In this way, power consumption can be dynamically adjusted from within without the need to enter the AMS processor device of an external computing device. 본 발명의 다양한 예시적인 실시예에 따라, 도 1에 도시된 바와 같은 AMS는 레벨 1 및 레벨 2 캐시 파티션으로서 기능하는 SRAM(14)의 일부와, 레벨 3 캐시 파티션으로서 기능하는 DRAM(16)의 일부와 고속 어댑티브 캐시로서 사용되도록 구성된다. According to various exemplary embodiments of the invention, a DRAM (16) functioning as a part, and a level 3 cache partition the SRAM (14) which serves the AMS as shown is a level 1 and level 2 cache partition in Figure 1 It is configured to be used as part of a high speed adaptive cache. 고속 캐시는 결합된 시스템에 대한 데이터 저장과 검색을 적합하게 확장시키도록 외부 컴퓨팅 디바이스의 기존 캐시 시스템과 함께 작동할 수 있다. High speed cache may work with conventional cache system of an external computing device so as to suitably extend the data storage and retrieval for the combined system. AMS 집적 캐시는 바람직하게는 부트 코드 미러, 프로그램 데이터, 프로그램 코드, 및 애플리케이션 데이터에 관한 동작에 연관된 데이터 전송 및 데이터 저장에 활용된다. AMS integrated cache is preferably used in data transmission and data storage associated with the operation of the boot code in the mirror, program data, program code, data, and applications. 이러한 기능에 사용되는 캐시의 크기 및 레벨은 구성 설정과 필요한 성능 측정장치에 기초하여 동적으로 할당된다. Size and level of the cache used for these functions are allocated dynamically on the basis of the performance measurement system and the required configuration. 부트 코드는 플래시(18)로부터 SRAM 캐시(14)로 복사되어 빠르게 디바이스 프로세서를 초기화한다. Boot code is copied to the SRAM cache 14 from the flash 18 to quickly reset the device processor. 이것은 SRAM 캐시(14)의 최초 사용을 나타낸다. This represented the first use of the SRAM cache 14. 추가적인 프로그램 코드는 플래시(18)로부터 요청된 데이터로서 식별된다. Additional program code is identified as the requested data from the flash (18). 이러한 추가 프로그램 코드는 할당된 캐시 크기 및 가용성에 따라 SRAM 또는 DRAM 캐시(14, 16) 중 어느 하나로 복사될 수 있다. This additional program code may be reproduced by any of the SRAM or DRAM cache (14, 16) according to the assigned cache size, and availability. 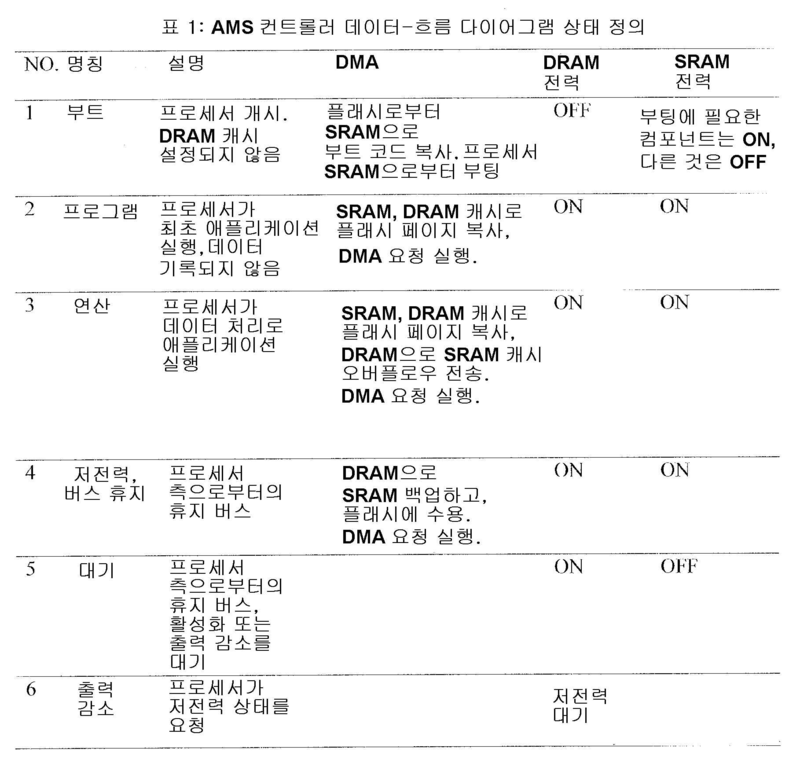 바람직하게는 SRAM 캐시(14)가 DRAM 캐시를 사용하면, 계속해서 DRAM 데이터를 리플레시해야 하므로 SRAM 캐시에 비해 더 전력 소비가 많기 때문에, DRAM 캐시(16) 보다 먼저 채워진다. Since preferably there are many more power than SRAM cache because the SRAM cache 14. The cache DRAM, continue to be refreshed when the DRAM data, are filled before the DRAM cache 16. 도 4는 본 발명의 하나의 실시예에 따라 AMS 메모리 컴포넌트와 AMS 컨트롤러(60) 사이의 데이터 전송을 도시한다. Figure 4 illustrates data transmission between the memory component and AMS AMS controller 60 in accordance with one embodiment of the present invention. 이러한 도면에서, 플래시 데이터의 이산 블록을 "페이지"라고 한다. In this figure, it referred to as "pages" the discrete blocks of the flash data. 이러한 데이터 페이지는 최초에, 경로 P1으로 지시된 바와 같이, 플래시(80)에서 SRAM(62)으로 전송된다. The data page is the first, it is transferred from the flash 80, as indicated by path P1 as SRAM (62). 페이지는 그런다음 함께 그룹화되어 경로 P2를 통해 캐싱되어 부트 코드 데이터(64)의 블록을 생성하고, 이는 경로 P3를 통해 컨트롤러(60)로 전송된다. Pages are grouped together and then been cached by the path P2 of the boot code generates the block data 64, which is transmitted to the controller 60 through the path P3. 초기화 시퀀스 또는 부팅의 일부로서, 컨트롤러(60)는 DRAM 액세스를 포함하는 정상 동작을 허용하도록 DRAM 캐시(72)를 설정한다. As part of the initialization or boot sequence, the controller 60 sets the DRAM cache 72 to allow for normal operation including a DRAM access. 컨트롤러(60)는 그런다음 경로 P1을 통해 플래시(80)로부터 원래 전송된 SRAM 데이터 페이지로부터 경로 P4를 통해 캐싱된, SRAM 캐시(62)로부터 경로 P5를 통해 전송된 프로그램 코드(66)를 이용하여 동작한다. The controller 60 may use the program code (66) transmitted through the path P5 from, SRAM cache 62, cache via path P4 from the originally transmitted SRAM data page from then flash 80 via a path P1 It operates. SRAM 캐시(62)의 한정된 용량이 초과되면, 캐싱되는데에 필요한 코드의 추가적인 페이지가 SRAM 캐시(62)로부터 DRAM 캐시(72)로 경로 P6를 통해 전송되거나, 또는 SRAM 캐시(62)가 가득 찼다고 판정되고 추가적인 페이지는 아직 SRAM 캐시(62)에 제공되지 않았다면, 그것들은 경로 P7를 통해 플래시(80)로부터 DRAM(72)으로 직접 전송된다. When the limited capacity of the SRAM cache 62 is exceeded, the caching there is dumped on a full additional page of the required code transmitted over a path P6 to the DRAM cache 72 from the SRAM cache 62, or, or SRAM cache 62, and and determining additional page is not yet provided to the SRAM cache 62, they are sent directly to the DRAM (72) from the flash 80 via a path P7. 컨트롤러(60)는 그런다음 경로 P12를 통해 액세스된 DRAM 캐시(72)에 저장된 프로그 램 코드를 실행할 수 있다. Controller 60 may then run the program code stored in the DRAM cache 72 is accessed through the path P12. 프로그램 및 애플리케이션 데이터가 내부 버스 시스템(20)(도 1참조)내로부터의 AMS 메모리 공간을 채운다. And application program data is an internal bus system 20 (see Fig. 1) fills the AMS memory space from within. 도 4에 도시된 바와 같이, 컨트롤러(60)는 경로 P10, P11, P14, 및 P13을 이용하여, SRAM 또는 DRAM 캐시(62, 72) 중 어느 하나에서의 애플리케이션 데이터 또는 프로그램 데이터(68, 70, 76, 및 78)의 블록에 액세스한다. 4, the controller 60 includes a path P10, P11, P14, and using a P13, SRAM or DRAM cache (62, 72) application data or program data (68, 70 in any of, the access block 76, and 78). 플래시(80)로 애플리케이션 데이터를 수용(收容)시키기 위해, 정보의 페이지 또는 페이지들은 먼저 SRAM 또는 DRAM 캐시(62, 72) 중 어느 하나에서 어셈블리되어야 한다. In order to accommodate (收容) the application data to the flash 80, a page or pages of information are to be first assembly of any of the SRAM or DRAM cache (62, 72). 컨텐츠가 확인되었을 때, 컨트롤러(60)는 페이지 또는 페이지들이 플래시(80)로 "수용되었다"고 지시한다. When the content is confirmed, the controller 60 includes a page or pages to indicate that "was accepted" by the flash (80). 이것은 경로 P15 "수용" 및 경로 P16 "수용"에 의해 지시된다. This is indicated by the path P15 "acceptance" and the path P16 "receive". 수용된 페이지는 그런다음 경로 P1를 이용하여 플래시(80)로 기록된다. Page is received by using the path P1 is then written to the flash (80). 컨트롤러(60)는 또한 SRAM 및 DRAM(68, 76) 사이의 애플리케이션 데이터의 전송을 요청할 수도 있다. Controller 60 may also request the transmission of application data between the SRAM and DRAM (68, 76). 요청시, 경로 P8 및 P9에 의해 지시된 바와 같이 전송이 스케줄링되고 실행된다. On request, the transmission is scheduled and run as indicated by the path P8, and P9. 본 발명의 다양한 예시적인 실시예에 따라, AMS 컨트롤러 로직의 알고리즘 기능은 하기와 같이 수행되도록 설정된다. According to various exemplary embodiments of the invention, the algorithm of the AMS function logic controller is set to be carried out as follows. 1. 캐싱 페이지 데이터 전용의 SRAM 및 DRAM의 부분들을 동적으로 할당하고, 플래시 메모리에 저장된 휴리스틱(heuristics), 미리설정된 세팅, 및 과거의 메모리 액세스 정보에 기초하여 이러한 할당을 조정한다. 1. The dynamic allocation of the portions of the SRAM and DRAM cache data page only, adjust these allocations on the basis of heuristics (heuristics), preset settings, and memory access information in the past stored in the flash memory. 할당 요청은 AMS 메모리 컴포넌트로부터의 데이터 판독과 그로의 데이터 기록을 위한 프로세서로부터의 요청 및 DMA 전송 요청을 포함한다. Allocation request comprises a request and a DMA transfer request from the processor for data read operation and therefore the data writing from the AMS memory component. 메모리 할당 알고리즘의 구현은 도 5와 연관된 하기의 표 1 및 표 2에 도시된다. Implementation of the memory allocation algorithm is shown in Table 1 and Table 2 below associated with the FIG. 2. 도 6-8에 도시된 데이터 미리보기 스킴을 이용하여, 다른 메모리 블록으로부터 미러링된 데이터로 SRAM 및 DRAM 캐시의 일부분을 채운다. 2. Using the data preview scheme shown in Figure 6-8, and fill a portion of the SRAM and the DRAM cache to the mirrored data from the other memory blocks. 이러한 데이터 할당은 조정가능한 데이터 버스 폭을 이용하고, 전력 소비를 최소화하기 위해 결정된 속도로 발생한다. This data is assigned using the adjustable width of the data bus and generating a rate determined in order to minimize power consumption. 3. 기록되지 않고 사용할 것으로 판정되지 않은 휘발성 SRAM 및 DRAM 캐시의 일부의 전원을 차단한다. 3. Disconnect the power part of the non-determined to be not written-volatile SRAM and DRAM cache. 최초에, 이러한 메모리 컴포넌트는 기록되지 않은 것으로 마킹되고, 메모리의 각각의 부분은 데이터 캐싱에 필요할 때에만 전력이 공급된다. First, such a memory component is marked as not being recorded, each portion of the memory, power is supplied only when needed in the data cache. 도 5는 상태 기계의 형태로 되어있는 AMS 컨트롤러 데이터-흐름 다이어그램을 도시한다. It shows a flow diagram - Figure 5 is in the form of a state machine controller AMS data. 표 1은 대응하는 상태 정의를 나열하고, 표 2는 데이터-흐름 다이어그램에 연관된 대응하는 상태 변환을 나열한다. Table 1 lists the conditions defined corresponding, and Table 2 data - a list of the corresponding state transition diagram which is associated with the flow. AMS 컨트롤러 데이터 미리보기 캐싱 스킴은 어떠한 특정한 데이터 요청이 외부 컴퓨팅 디바이스의 프로세서에 의해 시작되는 지를 예측하도록 설계된다. AMS Controller Preview Data caching scheme is no specific data requests are designed to predict whether initiated by the processor of the external computing device. 예측된 데이터 요청에 관한 특정한 코드 또는 데이터는 고속 메모리 디바이스로 미리 로딩되어(즉, 캐싱되어) 프로세서가 유사한 코드 또는 데이터에 대한 요청을 할 때 그것이 빠르게 검색될 수 있도록 한다. A specific code or data related to the forecasted data requests are pre-loaded with a high-speed memory device (i.e., the cache) so that the processor is that it can be rapidly retrieved when a request for a similar code or data. 도 6은 섹터 데이터의 시퀀스로 AMS SRAM 및 DRAM 캐시(14, 16)의 일부를 채우도록 하기 위한 이러한 데이터 미리보기 스킴을 실행하는 것을 도시한다. Figure 6 shows the running data such preview scheme for AMS so as to fill a part of the SRAM and DRAM cache (14, 16) into a sequence of data sectors. 데이터 섹터는 일반적으로 약 512 바이트인 운영 체제에 의해 어드레싱가능한 가장 작은 데이터 블록이다. Data sector is generally the smallest possible data blocks addressed by approximately 512 bytes of the operating system. 섹터 데이터(93)의 시퀀스는 그의 길이에 의해 특징지어지는 임의의 순서로 된 섹터 데이터의 세트이다. The sequence of the sector data 93 is a set of the sector data in any order, characterized by its length. 본 발명의 미리보기 캐싱 스킴은 이롭게도 레벨 3의 DRAM 캐시(16)의 부분 뿐만 아니라 레벨 1 및 레벨 2 SRAM 캐시(14)의 부분에 대해서도 예측된 캐시 데이터의 시퀀스로 프리로딩(preload)되는 것을 허용하고, 이는 하기에 기술되는, 블록(96, 102)에서의 런-타임 애플리케이션 데이터와 과거 캐시 데이터의 비교를 통해 판정된다. Preview caching scheme of the present invention that advantageously part, as well as level 1 and level 2 SRAM cache 14 is preloaded (preload) to the sequence of the cached data prediction about the portion of the DRAM cache 16 of FIG. Level 3 allowed, which in the run-in blocks (96, 102) to be described below - is determined by comparing the time the application data and the history data cache. 애플리케이션이 블록(90, 92)에서처럼 외부 컴퓨팅 디바이스에서 실행될 때, 획득된 애플리케이션 섹터 데이터(93)의 시퀀스는 블록(94, 96)에서처럼 높은 확률의 매칭이 블록(98)에서 발견될 수 있는지를 판정하기 위해 미리 저장된 섹터 데이터의 시퀀스 각각에 비교된다. Determine whether the application block (90, 92), as it runs from the external computing device, the sequence of the acquired application sector data 93 is a block (94, 96), as can be found in the block 98, matching between the high probability It is compared to a pre-stored sequence with each sector data to. 높은 확률의 매칭을 발견하는 것이 하기에 기술된다. It is described to be a high probability of finding a match. 이러한 높은 확률의 매칭이 각각의 저장된 시퀀스에 대해 비교하여 판정된다면(98에서 Yes), 미리 저장된 시퀀스 매칭은 높은 확률의 매칭으로 플래그되고 바람직한 SRAM 캐시가 이미 차 있는지에 따라 블록(104)에서 SRAM 또는 DRAM 캐시 중 어느 하나로 프리로딩된다. If the matching of such a high probability determined by comparison of the respective stored sequence (from 98 Yes), the pre-stored sequence matching in block 104, depending on whether, and flag to the matching of the high probability of a preferred SRAM cache is already car SRAM or It is pre-loaded by one of the DRAM cache. 이러한 높은 확률의 매칭의 판정은 블록(94, 100)에서 특정한 획득된 애플리케이션 섹터 데이터(93)의 시퀀스와 각각의 미리 저장된 섹터 데이터의 시퀀스 사이의 결정된 차이의 값에 대해 측정된 높은 확률의 임계값(또는 높은 확률의 매칭(HPM) 값)에 기초한다. Determination of the matching of such a high probability of the block (94, 100) in particular obtained application sector data 93, threshold values ​​in a sequence with a high probability measure for the value of the difference determined between the sequence of each of the pre-stored sector data of based on (or a high probability of matching (HPM) value). 하나의 실시예에서, 높은 확률의 임계값은 획득된 애플리케이션 시퀀스와 미리 저장된 시퀀스 사이의 매칭하는 시퀀스 섹터의 퍼센트 값(즉, 90-95%)에 관한 것이다. In one embodiment, to a threshold value of high probability percentage of the sector sequence matching between the obtained sequence and the application previously stored sequence (i.e., 90-95%). 이러한 실시예에서, 판정된 차이값은 또한 백분위수의 비교를 활용하기 위해 퍼센트값에 관한 것이 된다. In this embodiment, it is determined that the difference value is also directed to a percentage value to be compared utilizing the percentile. 임의의 미리 저장된 섹터 데이터의 시퀀스에 대해 판정된 차이 값이 높은 확률의 임계값보다 더 작고, 또한 획득된 애플리케이션 섹터 데이터의 동일한 시퀀스(98에서 Yes)에 대해 판정된 차이값보다 더 작다면, 그 미리 저장된 섹터 데이터의 시퀀스는 획득된 애플리케이션 섹터 데이터(93)의 특정한 시퀀스에 연관된 높은 확률의 매칭이 될 것으로 판정된다. If smaller than any of the previously stored sectors of data smaller than the threshold value of the high probability of the difference value determined for the sequences, and determined for the same sequence (Yes at 98) of the acquired application sector data difference values, and sequence of pre-stored data sector is determined to be a high probability of matching associated with a particular sequence of the obtained application data sector 93. 그러나, 높은 확률의 매칭이 판정될 수 없다면(98에서 No), 어떠한 미리 저장된 섹터 데이터의 시퀀스도 높은 확률의 임계값보다 더 작은 판정된 차이값을 가지기 때문에, 가장 낮은 판정된 차이값이 블록(102)에서 더 낮은 정확도의 가장 가능성있는 시퀀스 임계값(또는 가장 가능성있는 시퀀스 매칭(MLSM) 값)에 비교된다. However, if there is no matching between the high probability can be determined (98 from No), any previously stored, because the sequence of the sector data also have a smaller determine a difference value that is less than the threshold value of high probability, the lowest determining a difference value block ( 102) is compared to a further threshold the most likely sequence in the low accuracy (or most likely sequence matching (MLSM) value) in the. 하나의 실시예에서, 가장 가능성있는 시퀀스 임계값은 또한 획득된 애플리케이션 시퀀스와 미리 저장된 시퀀스 사이의 매칭하는 시퀀스 섹터의 퍼센트값(즉, 70-75%)에 관한 것이다. In one embodiment, to a most likely sequence threshold is also a percent value of the sector sequence matching between the application sequence and the pre-stored sequence of acquisition (i.e., 70-75%) in. 이러한 실시예에서, 판정된 차이값은 또한 백분위 비교를 활용하기 위해 퍼센트값에 관한 것이 될 것이다. In such an embodiment, the determined difference value will also be that of a percentage to take advantage of the percentile comparison. 가장 낮은 결정된 차이값이 높은 확률의 임계값보다 더 높지만 가장 가능성있는 시퀀스 임계값 보다 더 낮은 것으로 측정되면(98에서 No, 102에서 Yes), 섹터 데이터의 미리 저장된 시퀀스는 획득된 애플리케이션 섹터 데이터의 특정한 시퀀스에 연관된 가장 가능성있는 시퀀스 매칭인 것으로 판정된다. The high, but more than the lower of the high difference probability determined threshold most when potential sequence threshold lower measured to be more than that (from No, 102 in 98 Yes), the sector data previously stored sequence is specific of the acquired application sector data It is determined to be the most likely sequence matching that associated with the sequence. 이경우, 가장 가능성있는 시퀀스 매칭이 결정되면(102에서 Yes), 연관된 미리 저장된 시퀀스 매칭은 가장 가능성있는 시퀀스 매칭으로서 플래그되고, 바람직한 SRAM 캐시(14)가 이미 차있는지 여부에 따라 블록(104)에서 SRAM 또는 DRAM 캐시 중 어느 하나로 프리로딩된다. In this case, SRAM in the block 104 depending on whether the most when potential sequence match is determined in (at 102 Yes), the associated pre-stored sequence matching is flag as the most likely sequence matching, the preferred SRAM cache 14 already car or it is pre-loaded by any one of the DRAM cache. 더 낮은 정확도의 가장 가능성있는 시퀀스 매칭이 있다면, 시퀀스는 도 8을 참조하여 하기에 보다 상세히 기술되는 바와 같이 재-튜닝을 위해 더 플래그될 것이다. If there is no matching sequence in the possibility of a low accuracy, the sequence again as will be described in more detail below with reference to FIG. 8, it will be more flags for tuning. 재-튜닝에 대한 필요성은 특히 시퀀스가 가장 가능성있는 시퀀스 매칭으로 식별되는 경우, 이러한 시퀀스가 튜닝 조정(즉, 섹터 데이터의 순서 재부여)이 더 필요한 때에 반복적으로 지시된다. Re-identified when the need for tuning is particularly sequences that matched the sequence is most likely, this sequence a tuning adjustment (that is, the order of the re-assigned sector data) are indicated repeatedly when the further required. 가장 가능성있는 시퀀스 매칭이 결정될 수 없다면(102에서 No), 미리 저장된 섹터 데이터의 시퀀스 중 어떠한 것도 가능성있는 시퀀스 임계값보다 더 작은 판정된 차이값을 가지기 때문에, AMS 컨트롤러(12)는 블록(106)에서 오류 판정 가능성에 기초하여 애플리케이션 섹터 데이터의 특정한 획득된 시퀀스가 저장되어야하는지 여부를 판정한다. If the most likely sequence matching can be determined because (at 102 No), have a smaller determine a difference value that is less than the sequence threshold potential Any of a sequence of previously stored sectors of data, AMS controller 12 block 106 from the basis of the potential error is determined to be stored it determines whether or not a specific application, the acquired sequence of the sector data. 블록(106)에서 No라면, 재시험 비교가 구현된다. If No in block 106, a comparison is implemented retest. 블록(106)에서 Yes라면, 애플리케이션 섹터 데이터의 특정한 획득된 시퀀스는, 도 7을 참조하여 하기에 상세히 기술되는 바와 같이, 캐시 트레이닝 시퀀스를 시작함으로써 캐시로 프리로딩되어야 한다. If Yes in block 106, the obtained sequence of a particular application the sector data is to be pre-loaded into the cache, the cache by initiating the training sequence as will be described in detail below with reference to FIG. 도 7은 블록(110, 112)에서처럼, 외부 컴퓨팅 디바이스에서 동작하는 애플리케이션으로부터 획득된 섹터 데이터(113)의 특정한 시퀀스로 AMS SRAM 및 DRAM 캐시(14, 16)의 부분을 채우기 위한 AMS 컨트롤러 캐시 데이터 미리보기 트레이닝 시퀀스의 실행을 도시한다. 7 is a block (110, 112), as shown, AMS controller caches the data to fill the portion of the sector data AMS SRAM and DRAM cache (14, 16) in a particular sequence 113 obtained from the application running on the external computing device, preview view shows the execution of the training sequence. 애플리케이션 섹터 데이터의 시퀀스가 로딩을 끝내고, 타임아웃, 또는 블록(114)에 도시된 것처럼 미리 정해진 크기 제한을 초과한 후에, 트레이닝 시퀀스는 시퀀스 데이터 감소 블록(118)으로 진행하고, 그런다음 섹터 데이터(116, 122)의 미리 저장된 시퀀스에 대해 블록(120)에서 데이터 스토리지를 캐싱한다. The sequence of the application sectors of data to end-loading, time-out, or after the block exceeds a predetermined size limit, as shown in 114, the training sequence proceeds to a sequence of data reduction block 118, then the sector data ( 116, the cache data storage in block 120, for the pre-stored sequence of 122). 휘발성 SRAM(14) 또는 DRAM(16) 캐시 중 어느 하나로의 시퀀스 데이터 저장시에, AMS 컨트롤러는 캐시 할당을 위해 지정된 시퀀스 데이터의 복사본을 백업 데이터 스토리지 디바이스로서의 비휘발성 플래시로 더 전송한다. In any one sequence of data during storage in the volatile SRAM (14) or a DRAM (16) cache, AMS, the controller further transmits a copy of the sequence data given to the cache allocated to the non-volatile flash as a backup data storage devices. 블록(118)에서의 데이터 감소는 섹터 데이터의 순서가 정해진 범위로 구성된 시퀀스로 순서가 정해지지 않은 섹터 데이터의 시퀀스를 대체함으로써 구현된다. Data reduction in block 118 is implemented by replacing the sequence of the sector data, the order is not fixed as a sequence the order of the sector data composed of a predetermined range. 이러한 감소는 보다 효율적인 캐시 스토리지 및 검색 메커니즘을 생성한다. This reduction creates a more efficient cache storage and retrieval mechanism. 도 8은 저장된 섹터 데이터(136)의 기존 시퀀스를 블록(124, 126, 128 및 130)에서처럼 애플리케이션 섹터 데이터(127)의 획득된 시퀀스에 비교하기 위해 AMS SRAM 및 DRAM 캐시(14, 16)의 부분을 튜닝하기 위해 AMS 컨트롤러 캐시 데이터 미리보기 튜닝 시퀀스를 실행하는 것을 예시한다. Portion of Fig. 8 is a block existing sequence of the stored sector data 136 (124, 126, 128 and 130), as in order to compare the sequence of acquisition of the application sector data (127) AMS SRAM and DRAM cache 14,16 to illustrate that the AMS controller cache data previously run view tuning sequence for tuning. 그 결과인 섹터 데이터의 순서가 정해지지 않은 시퀀스는 후속하여 블록(132)에서 섹터 데이터의 순서가 정해진 시퀀스로 튜닝되고 블록(134)에서 순서가 정해진 시퀀스(136)의 범위로서 저장된다. As a result, the sequence that the order of the sector data has been set and subsequently stored as a range of block 132, the sector data sequence 136, the order is tuned to a specified sequence defined in the sequence block 134 in. 튜닝 시퀀스의 최초 실행이 섹터 데이터의 모든 시퀀스의 순서화를 효과적으로 재정의하지 못하면, 튜닝 시퀀스가 반복된다. The first run of the tuning sequence fails to effectively override the ordered sequence of all the sector data, the tuning sequence is repeated. 도 9는 본 발명의 하나의 실시예에 따라 AMS 컨트롤러의 데이터 흐름과 연관된 대역폭 할당을 도시한다. Figure 9 illustrates the allocation of bandwidth associated with the data stream of AMS controller according to one embodiment of the invention. 본 실시예에서, AMS 컨트롤러(138)는 RAM 외부 프로세서 인터페이스(들)(146)와 DDR 외부 프로세서 인터페이스(들)(148) 뿐만 아니라, SRAM 내부 메모리 인터페이스(들)(140), DRAM DDR 내부 메모리 인터페이스(들)(142)를 포함한다. In this embodiment, AMS controller 138 RAM external processor interface (s) 146 and DDR external processor interface (s) 148 as well, SRAM internal memory interface (s) (140), DRAM DDR internal memory an interface (s) 142. 이러한 결합된 컨트롤러 인터페이스(140, 142, 144, 146, 및 148)는 외부 컴퓨팅 디바이스의 프로세서 버스 인터페이스(도시되지 않음)의 대역폭 보다 현저하게 더 큰 총 버스 대역폭을 가진다. Such a combined controller interface (140, 142, 144, 146, and 148) has a larger total bus bandwidth significantly higher than the bandwidth of processor bus interface (not shown) of the external computing device. 이러한 초과 버스 데이터 전송 용량은 AMS 컨트롤러(138)로 하여금 메모리 디바이스 사이에 직접 캐시 데이터 전송(DMA)을 하도록 하고, 동시에 외부 컴퓨팅 디바이스의 프로세서가 독립적으로 AMS 메모리 컴포넌트로부터의 데이터에 액세스하도록 한다. The excess bus data transfer capacity is to access data from the controller causes the AMS 138 and memory directly between the device to the cache data transfer (DMA), at the same time, the processor of the external computing device independent AMS memory component. 이러한 인터리브한 데이터 전송은 이롭게도 AMS 컨트롤러(138)가 증가된 총 데이터 전송 속도로 동작하도록 한다. The interleaved data is transmitted to an operation to a total data transmission rate AMS controller 138 is advantageously increased. 각 AMS 메모리 컴포넌트 디바이스 유형(SRAM(14), DRAM(16), 및 플래시(18))에 대한 실제 버스는 각각의 구현된 메모리 컴포넌트의 특정한 크기 및 용량 특성에 따라, 동일한 기수 또는 동일한 기수의 배수가 되도록 구성된다. The actual bus depending on the particular size and capacity characteristics of each of the implemented memory component, multiple of the same odd number or the same odd number of each AMS memory component device type (SRAM (14), DRAM (16), and flash 18) It is configured such that the. 도 9는 내부 인터페이스 컴포넌트(140, 142, 및 144)에 대한 내부 버스 대역폭과 외부 프로세서 인터페이스 컴포넌트(146, 148)에 대한 외부 버스 대역폭 사이의 4:1의 차이의 예를 도시하고, 이때 N은 4이고, SRAM에 대해 동일한 버스 구성이 사용되며, L은 4이며, 플래시에서 M은 4이다. Shows an example of a first difference, where N is: Figure 9 is 4 between the inner interface component (140, 142, and 144), internal bus bandwidth, and the external bus bandwidth to the external processor interface component (146, 148) for 4, and the bus configuration is the same used for the SRAM, and L is 4, M is in the flash is 4. AMS 컨트롤러(138) 초과 버스 용량은 외부 컴퓨팅 디바이스의 프로세서가 2 개의 상이한 내부 데이터 버스(B1 및 B2)를 통해 DRAM 메모리로 액세스할 때 활용될 수 있다. AMS controller 138 exceeds the bus capacity may be utilized for accessing the DRAM memory through the processor, the two different internal data bus (B1 and B2) of the external computing device. 이러한 인터리브된 액세스는 연속적인 DRAM 어드레스로부터의 캐시 데이터가 2개의 상이한 내부 DRAM 데이터 버스(B1, B2)에 의해 대안으로 제공되도록한다. These interleaved access is to be cached data from the continuous DRAM address is provided as an alternative by means of two different internal DRAM data bus (B1, B2). 이러한 병렬 DRAM 데이터 전송은 DDR 외부 프로세서 버스가 내부 버스에 필요한 것보다 더 빠른 데이터 전송 속도로 동작 되도록 한다. This parallel data transfer DRAM has to operate at a faster data transfer speed than the processor bus to an external DDR required for an internal bus. 이러한 액세스와 동시에, DMA 데이터 전송은 플래시(18)와 SRAM 또는 DRAM 메모리 디바이스(14, 16)에 포함된 캐시 사이에서 데이터 버스(B3 및 B4)를 이용하여 발생할 수 있다. At the same time, such an access, DMA data transfers may take place by using the data bus (B3 and B4) between the cache contained in the flash 18 and the SRAM or DRAM memory devices (14, 16). 실제 버스 대역폭 차이는 실제 내부 및 외부 버스 실행 사이의 대기 설정과 사이클 시간에서의 차이에 기인하여 이론적으로 4:1의 팩터와는 상이하게 될 수 있다. The actual bus bandwidth difference is theoretically 4 due to the difference of the actual external and internal bus cycle and set a standby time between: can be made is different from the factor of 1. 내부버스는 다중 버스 전송 프로토콜을 지원하며, 이는 외부 프로세서 버스에 의해 사용되는 동일한 프로토콜을 반영하지 못할 수 있다. Internal bus supports multiple bus transfer protocol, which may not reflect the same protocol used by the external processor bus. 예를 들면, DDR 외부 프로세서 프로토콜에 의해 사용되는 버전과 설정 모두는 실질적으로 내부 버스 프로토콜에 의해 사용되는 것과 상이하게 될 수 있다. For example, DDR both external processor protocol versions and settings that are used by a substantially may be different to that used by the internal bus protocol. 비휘발성 메모리(예를 들면 플래시)에 데이터를 기록하거나 그로부터 데이터를 판독하는 (초당 메가바이트로 일반적으로 측정되는)데이터 전송 속도를 증가시키는 하나의 방법은 동시에 다수의 메모리 컴포넌트로 데이터를 기록하고 그로부터 데이터를 판독하는 것이다. Non-volatile memory (e.g., flash) to one of a method of recording or increase the data rate (which is typically measured in megabytes per second) that from which the read data the data is at the same time, writing data to the plurality of memory components, and from which to read data. 이러한 병렬 데이터 전송 설계를 활용하면, 데이터의 커다란 블록이 다수의 별개의 메모리 컴포넌트를 이용하여 가능한 효율적으로 전송될 수 있다. By utilizing such a parallel data transmission design, there is a large block of data can be efficiently transmitted to the possible by using a plurality of separate memory components. 가능한 작은 판독-기록 데이터 단위 크기를 가지는 컴퓨팅 디바이스의 운영 시스템을 활용할 수 있는 것이 효익을 가진다. Small-readable - to be able to take advantage of the operating system of a computing device having a data recording unit has a size benefit. 더 작은 최소 단위 크기(즉, 데이터 섹터)를 활용하는 것은 더 작은 크기의 정보가 메모리로부터 판독되거나 기록될 때(예를 들면, 파일 디렉토리 정보가 다수의 작은 크기의 정보들로 인코딩될 때) 메모리 스토리지 공간을 불필요하게 낭비하는 것을 방지한다. When more is that less leverage minimum unit size (that is, the data sector) of a smaller size information is read or written from the memory (for example, when the file directory information to be encoded into a plurality of small size of the information) memory It prevents unnecessary waste of storage space. 또한, 더 작은 단위의 데이터를 활용하면 주어진 기록 매체를 마모시키는 불필요한 기록 동작을 방지할 수도 있다. Furthermore, when utilizing the data in smaller units also prevent unnecessary wear of the write operation to a given recording medium. 불행히도, 보다 빠른 데이터 전송 속도와 더 작은 섹터 크기를 달성하는 2개의 목적은 대개 상충관계에 있다. Unfortunately, the two purposes of achieving faster data transfer rate and a smaller sector size is usually in the trade-offs. 데이터 전송 속도를 증가시키면서 데이터 크기를 더 작은 단위로 유지하는 수단이 바람직하다. This while increasing the data transfer rate means for maintaining the size of the data into smaller units are preferred. 추가로, MCP 컴포넌트 사이의 최소 전력 손실과 최소 필요한 연결 모두를 가지는 수단을 달성하는 것이 바람직하다. In addition, it is desirable to achieve a minimum power loss and minimum necessary means having both the connection between the MCP component. 도 9에 도시된 바와 같이, AMS 컨트롤러(138)는 다수의 비휘발성 컴포넌트 인터페이스(144)(예를 들면 플래시 인터페이스)를 포함한다. As shown in Figure 9, the AMS controller 138 comprises a plurality of non-volatile component interface 144 (e.g., Flash interface). 이러한 다수 인터페이스는 동시에 다수의 비휘발성 컴포넌트로부터의 판독 및 그로의 기록을 하는것을 활용하여, 단일 비휘발성 디바이스의 다수 컴포넌트의 판독 및 기록 데이터 전송 속도를 증가시킨다. These multiple interfaces simultaneously utilized to read and write of the glow from the plurality of non-volatile components, thereby increasing the read and write data rates of multiple components of a single non-volatile device. 불행히도, 이는 더 작은 블록의 데이터가 저장될 때 고유의 단점을 가져온다. Unfortunately, this brings its own disadvantages when the data in smaller blocks are stored. 이러한 단점을 극복하기 위해, 본 발명의 개별 비휘발성 플래시 인터페이스(144)는 단일한 판독 또는 기록 동작 동안 개별 플래시 컴포넌트 각각을 이네이블링하는 특징을 포함한다. In order to overcome this drawback, the individual non-volatile flash interface 144 of the present invention includes the features of the stuffing ring for a single read or write operation, individual flash components each table. 컴포넌트를 이네이블링 또는 디세이블링하는 이러한 목적을 달성하기 위한 다수의 기술이 실현될 수 있다. It may be a component realized-enabling or disabling the ring number of techniques for achieving this end that. 제 1 기술은 각각의 비휘발성 컴포넌트로의 개별 이네이블 신호를 이용하는 것이다. The first technique is to use a separate enable signal to each of the non-volatile components. 이러한 기술은 주어진 판독 또는 기록 동작 동안 사용되지 않는 디바이스를 디세이블함으로써 전력 소비를 최소화하는 이점을 가진다. This technique has the advantage of minimizing the power consumption by disabling the devices that are not used for a given read or write operation. 제 2 기술은 주어진 기록 동작 동안 사용된 어드레스를 변형하는 것이다. The second technique is to transform the address used during a given write operation. 종래 기술에 공지된 바와 같이, 플래시와 같은 비휘발성 스토리지 디바이스는 결함이 있는 것으로 알려져서 정보를 저장하기 위해 사용될 수 없는 특정한 어드레스 위치를 가진다. As is known in the prior art, the non-volatile storage device such as a flash has a specific address locations that can not be used to store information alryeojyeoseo to be defective. 제 2 기술을 가지고, 기록되지 않는 것이 바람직한 개별 컴포넌트의 어드레스 위치가 결함있는 것으로 알려진 위치로 설정된다. Claim is desirable address position of a discrete component that is not the recording has a second technology is set to a known position as the defective. 초과 기록 동작은 이러한 어드레스 정보가 이미 결함있는 것으로 플래그되기 때문에 유효한 저장된 정보를 손상시키지 않고, 정보는 이러한 위치에서 검색되지 않는다. Exceeds the write operation without damaging the stored information is valid since the flag such that the address information is already defective, information is not found in this position. 이는 어드레스 정보가 이미 정상 동작을 위해 컴포넌트에 제공될 것을 요구받기 때문에 컴포넌트에 대한 추가적인 연결을 더 필요로하지 않는다. This is due to receive the address information is already required to be provided to the components for normal operation and does not require further additional connection for the components. 컴포넌트의 서브세트에 기록을 하는 목적은 따라서 컨트롤러와 비휘발성 스토리지 컴포넌트 사이의 연결을 추가할 필요없이 달성된다. The purpose of the recording to a subset of the components is thus achieved without having to add a connection between the controller and a non-volatile storage component. 도 1에 도시된 바와 같이, 본 발명의 하나의 실시예에서 AMS MCP 집적회로는 추가적인 DRAM 및 플래시 메모리 컴포넌트에 결합되는 확장 플래시 버스(26)와 확장 DRAM 버스(24)를 포함하도록 설계된다. As shown in Figure 1, AMS MCP integrated circuit in one embodiment of the present invention is designed to include a flash expansion bus 26 and the expansion DRAM bus 24 that is coupled to an additional DRAM and a flash memory component. 당업자에 의해 이해되는 바와 같이, 추가적인 DRAM과 플래시 메모리 컴포넌트는 기존 AMS 파일 시스템 파티션(50)내의 내장 SRAM/DRAM/플래시 설치가능 파일 시스템(54)에 있는 기존 드라이버 소프트웨어와 기능하도록 구성되어야 한다(도 3 참조). As will be understood by those skilled in the art, additional DRAM and flash memory component is to be configured to work with the existing driver software in a built-in SRAM / DRAM / Flash installable file system 54 in the conventional AMS file system partition 50 (Fig. reference 3). 그렇지 않으면, 부가된 DRAM 또는 플래시 메모리 컴포넌트는 예측할 수 없는 오류가 설치시 방지될 수 있도록 기존 AMS 메모리 컴포넌트 드라이버가 업데이트되는 것이 필요하다. Otherwise, it is the existing AMS memory component driver update is necessary so that they can be prevented when part of a DRAM or flash memory components are unpredictable errors installation. 추가로, 본 발명의 하나의 실시예에서, AMS MCP 집적 회로는 확장 버스 인터페이스(28)를 포함하도록 설계되어(도 1에 도시됨), 컨트롤러는 확장 버스를 통해 제 2 컴퓨팅 디바이스와 통신할 수 있다. Additionally, in one embodiment, AMS MCP integrated circuit of the present invention is designed to include an expansion bus interface 28 (shown in Figure 1), the controller can communicate with the second computing device via the expansion bus, have. 이러한 확장 버스 인터페이스(28)는 편의성과 간략화를 위해 확장 DRAM 버스(24) 및 확장 플래시 버스(26)에 독립적인 것으로 도시되지만, 확장 버스 인터페이스(28)는 AMS 컨트롤러 핀수를 감소시키기 위해 확장 DRAM 버스(24) 또는 확장 플래시 버스(26) 중 어느 하나로 설정가능하게 통합될 수 있다. The expansion bus interface 28 is shown to be independent of the expansion DRAM bus 24 and the expansion flash bus 26 for convenience and simplicity, the expansion bus interface (28) is extended DRAM bus to reduce the AMS controller pins 24 or expanded by any one set of the flash bus 26 may be integrated. 확장 버스 인터페이스(28)는 효과적으로 AMS 컨트롤러가 다수의 외부 컴퓨팅 디바이스와 동시에 통신하고 저장된 데이터를 전송하도록 한다. Expansion bus interface 28 effectively causes the AMS controller transmits a communication and the data stored at the same time with a plurality of external computing devices. 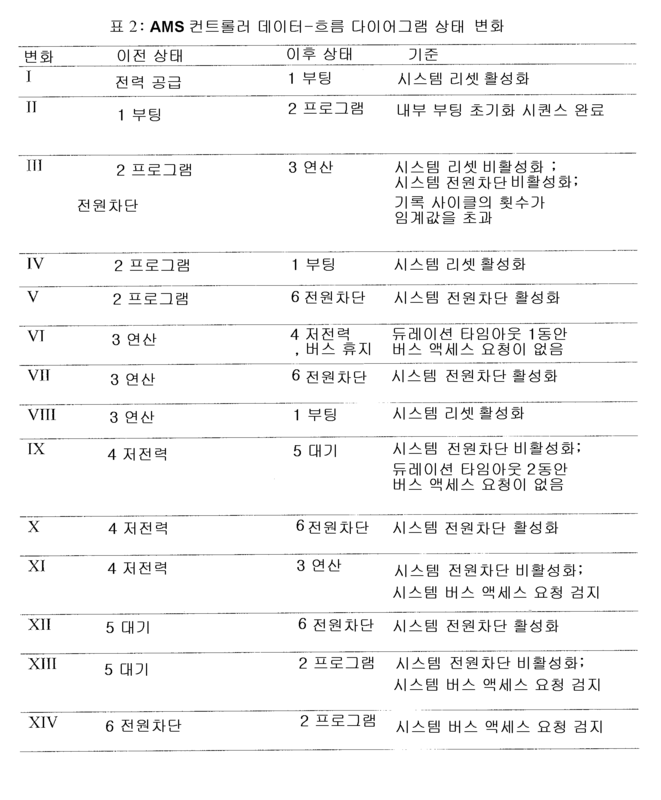 상술한 바와 같이, (도 1에 도시된)본 실시예의 SRAM(14), DRAM(16), 및 플래시(18) 메모리 컴포넌트는 AMS 내에서 기능할 수 있는 메모리 유형의 단순한 예시일 뿐이고, 본 발명은 본 실시예에서 사용되는 정확한 메모리 유형에 한정되는 것은 아니라는 것을 또한 이해해야한다. Merely one, (shown in Figure 1) as illustrative of the type of memory in example SRAM (14), DRAM (16), and a flash 18 of the present embodiment the memory component is to function in the AMS, as described above, the present invention It should also be understood that it is not limited to the exact type of memory used in this embodiment. 상술한 메모리 유형과 유사한 특성 및 기능을 제공하는 대안의 기술이 존재한다. The alternative technology, which provides similar characteristics and function as the above-mentioned type of memory exists. 예를 들면, SRAM(14)의 구현은 PSRAM(Pseudo SRAM)의 유형으로 대체될 수 있고; For example, the implementation of the SRAM (14) may be replaced by a type of a PSRAM (Pseudo SRAM); DRAM(16)의 구현은 ZRAM(Zero Capacitor RAM) 또는 TTRAM(Twin Transistor RAM)의 유형으로 대체될 수 있고; Implementation of the DRAM (16) may be replaced by a type of ZRAM (Zero Capacitor RAM) or TTRAM (Twin Transistor RAM); 플래시(18)의 구현은 낸드 또는 노어 유형 플래시로서 지정될 수 있거나, 또는 상변이 메모리(PCM, PPRAM)로 대체될 수 있다. Implementation of the flash 18 may either be specified as a NAND or a NOR flash type, or the phase change can be replaced by a memory (PCM, PPRAM). 명확하게, 상술한 대안의 메모리 컴포넌트 유형들은 배타적인 것이 아니고, 본 발명이 상술한 기능을 수행하도록 하는 다수의 다른 변형이 구현될 수 있다. Specifically, the memory components are the type of the above-mentioned alternative is not exclusive, there are a number of other modifications to the invention to perform the functions described above may be implemented. 제 1 항에 있어서, 제 1 메모리 유형은 정적 랜덤 액세스 메모리(SRAM)이고, 제 2 메모리 유형은 동적 랜덤 액세스 메모리(DRAM)이고, 제 3 메모리 유형은 플래시 메모리인 것을 특징으로 하는 어댑티브 메모리 디바이스. The method of claim 1 wherein the first type of memory is a static random access memory (SRAM), and the second type of memory is a dynamic random access memory (DRAM), a third type of memory is an adaptive memory device, characterized in that the flash memory. 전력 소비를 최소화하기 위해 제 1 및 제 2 메모리 유형의 일부의 전원을 차단하도록 더 설정되는 것을 특징으로 하는 어댑티브 메모리 디바이스. Adaptive memory device of claim 1 and claim 2 characterized in that is further configured to block some of the power of the type of memory in order to minimize power consumption. 상기 캐시-데이터가 SRAM 내에 존재하지 않고, 플래시 메모리 내에 존재한다면, 상기 캐시-데이터는 플래시 메모리로부터 DRAM으로 전송되는 것을 특징으로 하는 어댑티브 메모리 디바이스. The cache, if the data is not present in the SRAM, is present in the flash memory, wherein the cache-data adaptive memory device being sent to the DRAM from the flash memory. 데이터 미리보기 스킴에 따라 플래시 메모리로부터 SRAM 및 DRAM으로 데이터를 캐싱하도록 더 설정되는 것을 특징으로 하는 어댑티브 메모리 디바이스. Adaptive memory device, characterized in that according to the data preview scheme is further configured to cache the data to the SRAM and the DRAM from the flash memory. 제 1 메모리 유형 내의 스토리지 공간에 캐시-데이터 스토리지 할당을 하고, 제 1 메모리 유형 내의 스토리지 공간이 풀(full)이 된 것으로 판정된 후에, 캐시-데이터 스토리지 할당을 제 2 메모리 유형 내의 스토리지 공간에 할당하는 단계;를 포함하는 것을 특징으로 하는 방법. The first storage space in the memory type cache and a data storage allocation, after the storage space in the first memory type is determined that the full (full), the cache-allocates the data storage allocation in the storage space in the second memory type method comprises a, characterized in; that step. 제 6 항에 있어서, 제 1 메모리 유형은 정적 랜덤 액세스 메모리(SRAM)이고, 제 2 메모리 유형은 동적 랜덤 액세스 메모리(DRAM)이고, 제 3 메모리 유형은 플래시 메모리인 것을 특징으로 하는 방법. The method of claim 6, wherein the first type of memory is a static random access memory (SRAM), a second type of memory is a dynamic random access memory (DRAM), a third type of memory is characterized in that a flash memory. 전력 소비를 최소화하기 위해 기록되지 않은 제 1 및 제 2 메모리 유형의 일부의 전원을 차단하는 단계를 더 포함하는 것을 특징으로 하는 방법. Method according to claim 1, further comprising the step of blocking the first and second part of the power of the memory type that was not recorded in order to minimize power consumption. 상기 캐시-데이터가 SRAM 내에 존재하지 않고, 플래시 메모리 내에 존재한다면, 상기 캐시-데이터를 플래시 메모리로부터 DRAM으로 전송하는 단계;를 더 포함하는 것을 특징으로 하는 방법. The cache, if the data is not present in the SRAM, is present in the flash memory, the cache comprising: - transmitting data from the flash memory to the DRAM; method further comprising the. 데이터 미리보기 스킴에 따라 플래시 메모리로부터 SRAM 및 DRAM으로 데이터를 캐싱하는 단계를 더 포함하는 것을 특징으로 하는 방법. Method according to the data preview scheme, characterized in that said method further comprises caching the data in the SRAM and the DRAM from the flash memory. 제 1 메모리 유형 내의 스토리지 공간에 캐시-데이터 스토리지 할당을 하고, 제 1 메모리 유형 내의 스토리지 공간이 풀(full)이 된 것으로 판정된 후에, 캐시-데이터 스토리지 할당을 제 2 메모리 유형 내의 스토리지 공간에 할당하는; The first storage space in the memory type cache and a data storage allocation, after the storage space in the first memory type is determined that the full (full), the cache-allocates the data storage allocation in the storage space in the second memory type doing; 방법을 수행하도록 하는 것을 특징으로 하는 컴퓨터 판독가능한 매체. The computer-readable medium characterized in that to perform the method. 제 11 항에 있어서, 제 1 메모리 유형은 정적 랜덤 액세스 메모리(SRAM)이고, 제 2 메모리 유형은 동적 랜덤 액세스 메모리(DRAM)이고, 제 3 메모리 유형은 플래시 메모리인 것을 특징으로 하는 컴퓨터 판독가능한 매체. The method of claim 11, wherein the first type of memory is a static random access memory (SRAM), and the second type of memory is a dynamic random access memory (DRAM), and the third type of memory is a computer readable medium, characterized in that the flash memory . 전력 소비를 최소화하기 위해 기록되지 않은 제 1 및 제 2 메모리 유형의 일부의 전원을 차단하는 단계를 더 포함하는 것을 특징으로 하는 컴퓨터 판독가능한 매체. Not recorded in order to minimize power consumption, the first and the computer readable medium comprising the step of further 2 to block the part of the power of the memory type. 상기 캐시-데이터가 SRAM 내에 존재하지 않고, 플래시 메모리 내에 존재한다면, 상기 캐시-데이터를 플래시 메모리로부터 DRAM으로 전송하는 단계;를 더 포함 하는 것을 특징으로 하는 컴퓨터 판독가능한 매체. The cache, if the data is not present in the SRAM, is present in the flash memory, wherein the cache-data sending to the DRAM from the flash memory; computer-readable medium further comprising the. 데이터 미리보기 스킴에 따라 플래시 메모리로부터 SRAM 및 DRAM으로 데이터를 캐시-데이터를 전송하는 단계를 더 포함하는 것을 특징으로 하는 컴퓨터 판독가능한 매체. Data Preview data to SRAM and DRAM from the flash memory in accordance with a cache scheme, - a computer-readable medium according to claim 1, further comprising transmitting the data. 상기 제 1 레벨의 매칭은 상기 제 2 레벨의 매칭보다 매칭의 가능성이 더 높은 것을 특징으로 하는 컴퓨터 판독가능한 매체. Matching of the first level is a computer readable medium such that a higher potential than that of the matching matching of the second level. 제 16 항에 있어서, 제 1 메모리 유형은 정적 랜덤 액세스 메모리(SRAM)이고, 제 2 메모리 유형은 동적 랜덤 액세스 메모리(DRAM)이고, 제 3 메모리 유형은 플래시 메모리인 것을 특징으로 하는 컴퓨터 판독가능한 매체. 17. The method of claim 16, wherein the first type of memory is a static random access memory (SRAM), and the second type of memory is a dynamic random access memory (DRAM), and the third type of memory is a computer readable medium, characterized in that the flash memory . 상기 제 2 레벨의 매칭을 가지는 섹터 데이터의 시퀀스가 선택될 수 없다면, 캐시-데이터 트레이닝 시퀀스를 시작하는 것을 특징으로 하는 컴퓨터 판독가능한 매체. If the sequence of the sector data having the matching of the second level may be selected, the cache computer-readable medium, characterized in that to start the training sequence data. 제 18 항에 있어서, 캐시 데이터 트레이닝 시퀀스는 제 3 메모리 유형에 저장된 시퀀스의 비휘발성 사본을 가지면서 제 1 메모리 유형 또는 제 2 메모리 유형 중 어느 하나 내에 획득된 섹터 데이터의 시퀀스를 저장하는 것을 특징으로 하는 컴퓨터 판독가능한 매체. The method of claim 18, wherein the cache data, the training sequence is characterized in that it stores a sequence of the sector data obtained in the third while having a non-volatile copy of the sequence stored in the memory type one any one of the first memory type or the second memory type computer-readable medium. 제 19 항에 있어서, 제 1 메모리 유형은 정적 랜덤 액세스 메모리(SRAM)이고, 제 2 메모리 유형은 동적 랜덤 액세스 메모리(DRAM)이고, 제 3 메모리 유형은 플래시 메모리인 것을 특징으로 하는 컴퓨터 판독가능한 매체. 20. The method of claim 19, wherein the first type of memory is a static random access memory (SRAM), and the second type of memory is a dynamic random access memory (DRAM), and the third type of memory is a computer readable medium, characterized in that the flash memory . 상기 제 1 레벨의 매칭은 상기 제 2 레벨의 매칭보다 매칭의 가능성이 더 높은 것을 특징으로 하는 방법. Matching of the first level, characterized in that a higher potential than that of the matching matching of the second level. 제 21 항에 있어서, 제 1 메모리 유형은 정적 랜덤 액세스 메모리(SRAM)이고, 제 2 메모리 유형은 동적 랜덤 액세스 메모리(DRAM)이고, 제 3 메모리 유형은 플래시 메모리인 것을 특징으로 하는 방법. The method of claim 21, wherein the first type of memory is a static random access memory (SRAM), a second type of memory is a dynamic random access memory (DRAM), a third type of memory is characterized in that a flash memory. 상기 제 2 레벨의 매칭을 가지는 섹터 데이터의 시퀀스가 선택될 수 없다면, 캐시-데이터 트레이닝 시퀀스를 시작하는 것을 특징으로 하는 방법. If the sequence of the sector data having the matching of the second level may be selected, the cache - characterized in that to start the training sequence data. 제 23 항에 있어서, 캐시 데이터 트레이닝 시퀀스는 제 3 메모리 유형에 저장된 시퀀스의 비휘발성 사본을 가지면서 제 1 메모리 유형 또는 제 2 메모리 유형 중 어느 하나 내에 획득된 섹터 데이터의 시퀀스를 저장하는 것을 특징으로 하는 방법. The method of claim 23, wherein the cache data, the training sequence is characterized in that it stores a sequence of the sector data obtained in the third while having a non-volatile copy of the sequence stored in the memory type one any one of the first memory type or the second memory type How to. 제 24 항에 있어서, 제 1 메모리 유형은 정적 랜덤 액세스 메모리(SRAM)이고, 제 2 메모리 유형은 동적 랜덤 액세스 메모리(DRAM)이고, 제 3 메모리 유형은 플래시 메모리인 것을 특징으로 하는 방법. The method of claim 24, wherein the first type of memory is a static random access memory (SRAM), a second type of memory is a dynamic random access memory (DRAM), a third type of memory is characterized in that a flash memory. 가용한 메모리 용량을 확장시키기 위해 외부 메모리와 통신하는 적어도 하나의 확장 메모리 버스를 포함하도록 더 설정되는 것을 특징으로 하는 어댑티브 메모리 디바이스. In order to expand the available memory capacity adaptive memory device being further configured to include at least one expansion memory bus in communication with an external memory. 제 2 외부 컴퓨팅 디바이스와 통신하는 적어도 하나의 확장 메모리 인터페이스를 포함하도록 더 설정되는 것을 특징으로 하는 어댑티브 메모리 디바이스. The adaptive memory device according to claim 2 is further configured to include an external computing device in communication with at least one extended memory interface. 더 설정되는 것을 특징으로 하는 어댑티브 메모리 디바이스. Adaptive memory device characterized in that the further setting. 제 28 항에 있어서, 상기 단일 컨트롤러는 이네이블하게될 컴포넌트들로 이네이블링 신호를 전송함으로써 상기 다수의 컴포넌트 중 하나 이상을 선택적으로 이네이블하게 하는 것을 특징으로 하는 어댑티브 메모리 디바이스. 29. The method of claim 28 wherein the single controller is enabled by a cable to be transmitted to the component-enabling signal adaptive memory device characterized in that the selectively enabled in at least one of the plurality of components. 제 28 항에 있어서, 상기 단일 컨트롤러는 이네이블하게될 컴포넌트들의 어드레스 위치를 기지의 손상된 어드레스 위치로 설정함으로써 상기 다수의 컴포넌트 중 하나 이상을 선택적으로 디세이블하게 하는 것을 특징으로 하는 어댑티브 메모리 디바이스. 29. The method of claim 28 wherein the single controller is enabled by setting the address locations of the cable components to be damaged, the address position of the base of the adaptive memory device characterized by selectively disabling the at least one of the plurality of components.